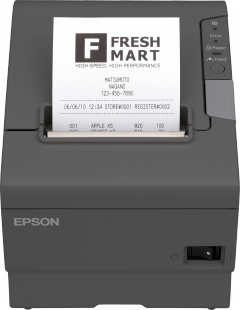 Epson TM-T88V driver is a program that controls your Epson TM-T88V POS thermal receipt printer. Whenever you print a document, the printer driver takes over, feeding data to the printer with the correct control commands. You must install them before you can use the printer. You can also download updated drivers from the Epson TM-T88V drivers manufacturer's Website. Description: This file contains the Advanced Printer Driver v5.10 for the Epson TM-T88V. This file allows for printing from a Windows application. Description: The ePOS-Print is Epson's unique printing function that uses XML and Web Service. Description: This file contains the JavaPOS ADK v1.14.6W for Windows. Description: This file contains the Printer Driver for Mac v1.2b. Description: This file contains the EpsonNet Config Utility v4.9.5. Description: This file contains the Thermal Linux Driver v1.0.1.0. Description: This is an SDK aimed at development engineers who are developing Android applications for printing on an EPSON TM printer and an EPSON TM Intelligent printer. Description: This is an SDK aimed at development engineers who are developing iOS applications for printing on an EPSON TM printer and an EPSON TM Intelligent printer. 0 Response to "Epson TM-T88V Driver Download Windows 10, Mac, Linux"